From left, Miguel Pachebat, Michael J. Savoy, Bob Donaghue, Betsy Nabel, Thomas Chafe, David Buffalo, Richard Wong, Shayne Houlihan and Andrew Sants. 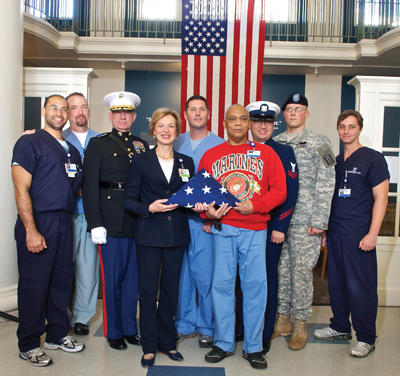 BWH President Betsy Nabel, MD, who cut the first piece of cake with a sword issued to Donaghue when he joined the U.S. Marine Corps, reflected on the meaning of Veterans Day and its significance at BWH. Donaghue, the operations manager for Security and Parking, is one of the BWH veterans who has been organizing this special ceremony at BWH for more than 10 years. A colonel who served in the Marines for 32 years, Donaghue strives to offer a meaningful ceremony for the hundreds of BWH veterans and their colleagues who attend. In addition to enjoying a giant cake courtesy of BWH Catering, staff were also treated to a special guest appearance by “Carrie Hall.” The NICU’s Kathleen Murphy, NP, donned a white nurse’s cap as she played the role of the legendary figure in BWH’s history, discussing her role during World War I.
Security’s Larry Nialetz is compiling a list of all BWH employees who have served in the military. E-mail lnialetz@partners.org with your name, rank and years of service to have your name added to the list.